Living well beyond 80, 90, and 100 years. I am simply fascinated with Phillip’s healthy lifestyle and warm personality. He is one of the kindest people I know – always smiling and happy; he gives the best hugs and always has something genuine to say! I’ve re-read this book many times and I love all the advice he gives about taking care of your body, mind and soul; it’s my go-to-book for tips on living a healthy, natural life. 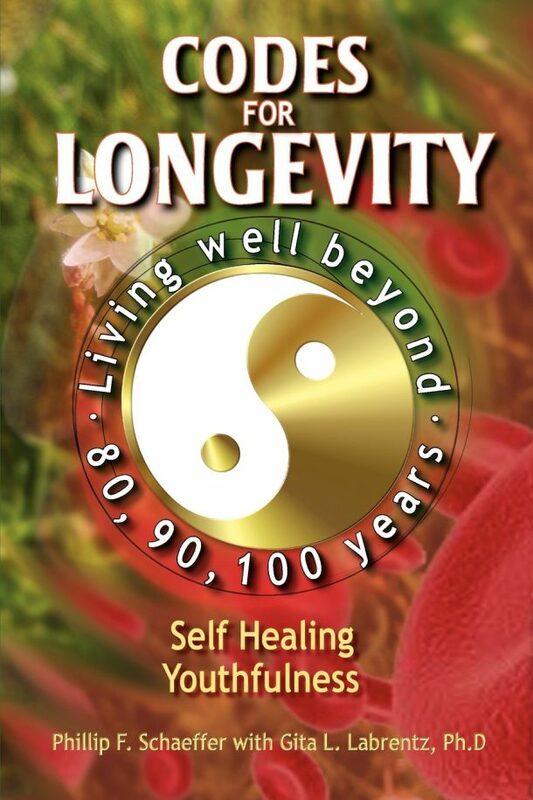 Phillip Schaeffer is a truly remarkable man with wonderful recommendations on how to promote longevity. And as they say… “Behind every great man, there is a great woman” (love you too Aunt Gita)! You both did a fabulous job on Codes for Longevity. Here are a few of Phillip’s sworn-by health tips that he has implemented into his daily life. Pick up a copy of your own HERE and read about many more lifestyle routines that will help improve the quality and length of your life. -Take time to practice deep breathing exercises daily. -Eating foods rich in anti-oxidant will counteract free radical damage. -Keep up-to-date in everything you do…reading, technology, events, entertainment. -Get involved in community activities; take up hobbies or college classes. Learning new things and helping others will ward-off depression. -Multivitamins A 10,000IU, B complex 400mg, B6, C and E, pantothenic, zinc 50mg and selenium 400mg, D (1,000 IU) and multivitamins daily. -Avoid using household cleaners. Use natural products such as vodka or alcohol to clean. – Drink 2 spoonfuls of apple cider vinegar in a glass of water 3 times daily (to alkalize the body). A body that is too acidic will lead to illness and disease. -detoxify your liver and practice eye exercises to eliminate glasses. Congrats Uncle Phillip and Aunt Gita! This entry was posted in Health + Beauty, Life, Uncategorized. ← Tights…Do You Wear Them? Thank you, Brittany and/or Brandon, for your unequivocal support and acknowledgment of our book CODES FOR LONGEVITY.